In Los Angeles, communities are ill-prepared to deal with the devastating aftermath of a major disaster. Basic police, fire department and medical services will be unavailable to local communities for days. Neighbors must be prepared to rely on themselves, with their own supplies, knowledge and organization. help you protect yourself, your family, your neighbors and your neighborhood in an emergency. Do yourself, your family and your neighbors a favor by learning about this important program today. 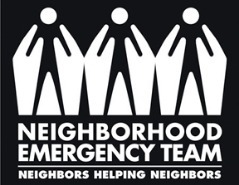 IN THE EVENT OF A CATASTROPHIC EMERGENCY, our city/country services will not be available for hours/days... Communities benefit by participation in the NEIGHBORHOOD EMERGENCY TEAM program. CERT trained neighbors working alongside their untrained neighbors into NETs, Neighborhood Emergency Teams. preparedness and response at the neighborhood level. Volunteer teams of 10-20 persons, living within a 3-5 block radius, led by CERT trained personnel from the area, are instructed in personal, family and limited group preparedness techniques. communications and field level medical treatment. Participation in your NTP, will help ensure your family's safety, as well as yourself. When the big one hits, our community will be ready to help ourselves and our neighbors. For information, go to the NTP-LA website and sign-up today. FEMA is online with many tips to help you prepare yourself, your loved ones and your home. In a regional emergency such as an earthquake, our communications systems—cell phones, land lines, and Internet— likely will fail. If it's a big earthquake, communications and power could be out for 10 days or more. As we survey our homes and neighborhood for casualties and damage, how can we communicate with members of our neighborhood disaster response team? FRS (Family Radio Service) radios, which are small, portable hand-held devices that function similar to walkie-talkies, work well for short range communication. Although they have limited range, as an addition to dispatching runners, skateboarders, and bicyclists with handwritten notes, hand-held two-way radios may help and are an important part of your family’s disaster preparedness kit. Anyone who uses a mobile phone can, with a little training and practice (and fresh batteries), become a good FRS radio communicator.